Send me an email when this item is in stock or available for pre-sale. Each case contains 24 boxes. Each box contains 12 packs. Each pack contains 7 cards. 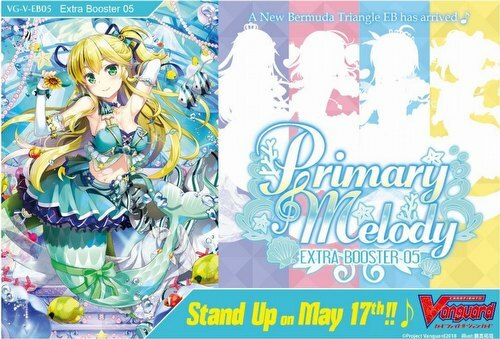 Cardfight Vanguard Primary Melody boosters strengthen the Schokolade Melody Trial Deck. At least 1 card featuring a character from the Bermuda Triangle Colorful Pastorale animation is included in each box. Each booster box contains 12 packs. There are 7 cards in each pack, two of which are rare or better. There are 45 cards in the set plus parallels (TBA). Each case contains 24 boxes.